Let's see....it has been a while.... oh yeah, guess I was on Block #8. Pick colours. Cut. Ahh, feels good to have a rotary cutter back in my hand. Sew. Press. Yes!! To keep or to rip? I am making all 100 blocks, so 101 is not going to cut it...I could put the extra on the quilt back. Or I could rip it and see if I can use the pieces in another block, since she repeats many same size squares and rectangles. Life is a bit*h...Spent a day ripping. Very carefully. These squares finish at 1", so not a lot of room for frayed edges. NEEDED TO SEW! MINDLESS! Spent last night sewing UFO project #1 for this winter. Love this Roll It Up! pillowcase pattern from All People Quilt. Made it many times. 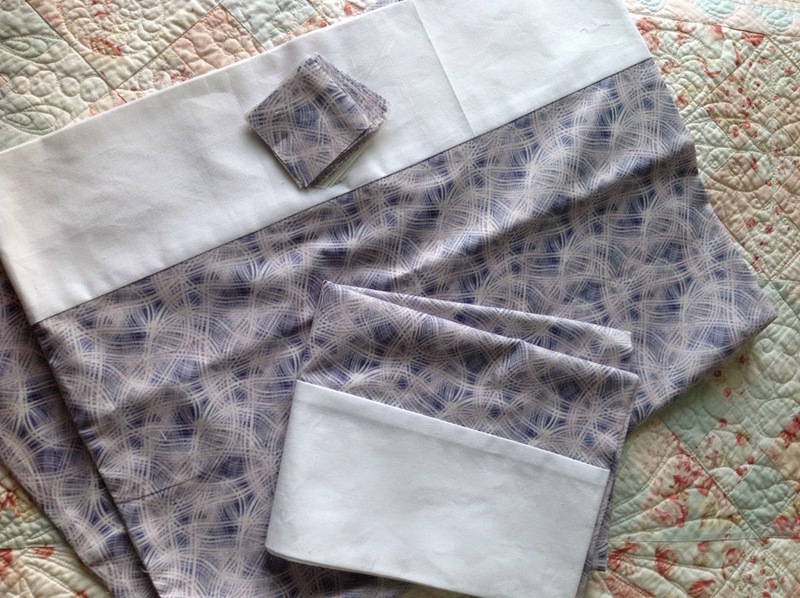 Had the blue fabric for years to make pillowcases. Notice the 2.5" squares in a pile? A tip from Cynthia's Scrap-a-Palooza series is growing my stock of organized 2.5" squares! Life's a beach... Today, I got my sewing room window fixed. (I know you're thinking wth? She was writing about Tula Pink blocks. No, pillowcases... Welcome to my menopausal regular mind...Just wait...) Yay! I can open my window now, and the screen is fixed so no bugs will come in! After my window was fixed, we headed out to Manasota Key for our first beach sesh. Needed to soothe my ripped up soul, lol. Not really, as I am so happy in this new house, but a beach day is always a good day. And today was stellar. Look at the colours! And this was just my iPhone 4. Don't you just LOOOVE the tray I used for background interest?! It's a "happy new home" gift from my darling friend and other-side-of-our-wall neighbour in Kingsville, Jude. Say what? Are you confused? Well don't be; they came for a visit! Our first guests here. They have a winter home in Winterhaven, Florida, so not too far away. She has an affinity for all things France, as do I, (especially Paris for her). I love to have my morning coffee outside, as well as my afternoon tea, with my book, and chocolate, so this will be perfect to load up and carry to my spot! So thoughtful of her; she knows me well. Speaking of happy new home gifts, on Saturday a Priority Post parcel was placed at my front door. 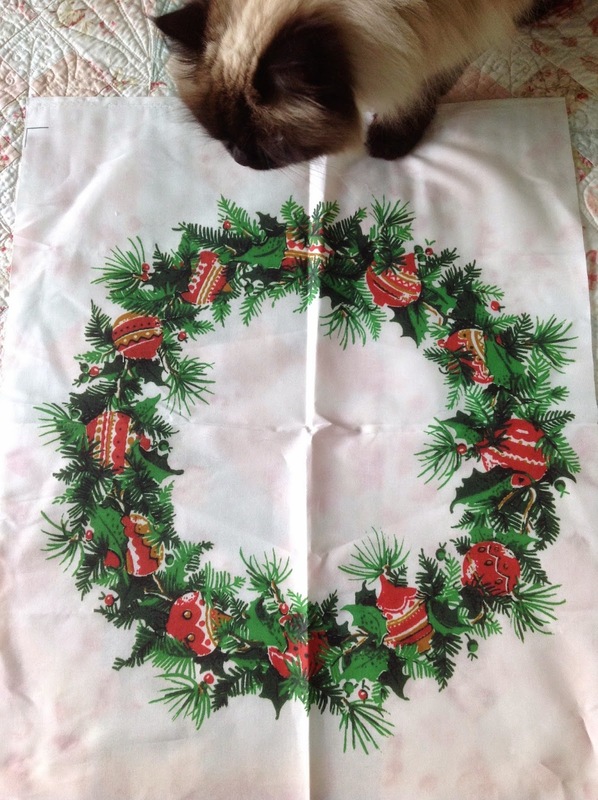 Remember I won Lara's (Buzzin Bumble) wreath fabric she created on Spoonflower? Well, that darling girl (I truly am so very blessed with such wonderful, thoughtful, caring friends) sent me a gift for my new sewing room. And WHAT a gift!!!! Holy generosity, Batman! There are three 1-yard cuts of Riley Blake Designs (a fabric line I've admired, but never have bought), a 1/2 yard cut of Kona cotton "Breakers" (Lara is so smart in how she labelled it with its colour name, and I'm going to copy her idea: a skinny Post-It note pinned to the fabric). 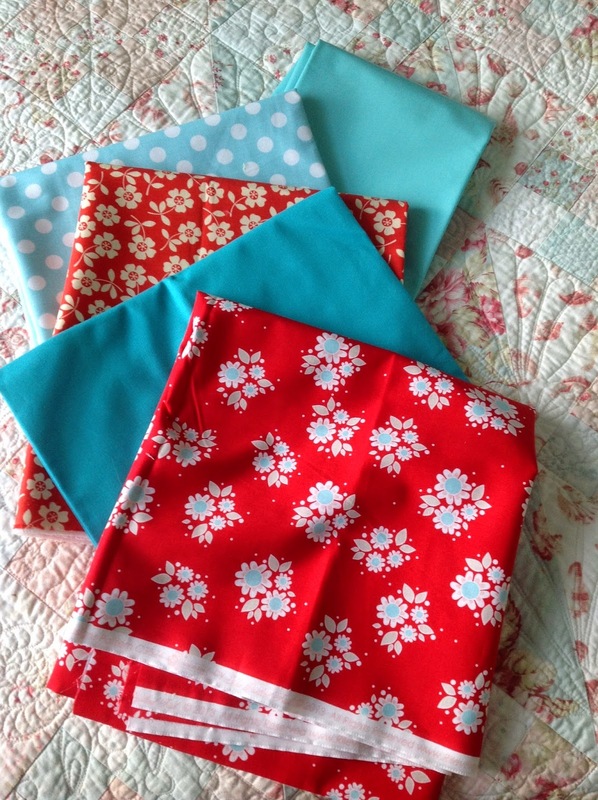 And there's a yard of a laminated cotton in aqua (the top fabric in the picture above)! I have never seen this before. I immediately thought of make-up bags, lunch bags...think there are a few members of my family who might benefit from experimenting with this. I was blown away, and so touched. I love florals, pastels, earth tones. But this past year I have been drawn to the modern bright colours, especially aqua with red (see my Over and Under quilt, though it's more of a mint than an aqua). I love the Christmas quilts and décor that I've seen done in aqua and red. Well, Lara has given me a push to actually create something (and I have a few ideas) with these two colours. I've been writing this blog just over a year now, and I started it, as most do, mainly to keep track of what I sew, and, a close second, to keep family and friends in the loop as to what I'm up to. I never dreamed I'd meet some wonderful, talented, warm people, who I now consider good friends. Today, I'm linking up for the first time with Freemotion By the River. Yes, lovely pic of the beach! Such a nice tray! Jude is so thoughtful, though only a recent friend, she knows you well. Yes, how nice to meet friends through such an unusual way - your blog! Hmmmm... (insert smile)... Love that last part.